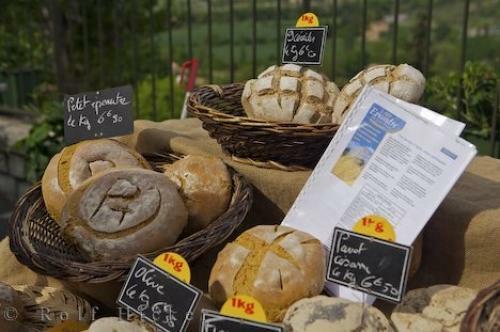 A bakers stall displays a fine selection of fresh bread, at the market in the village of Moustiers Ste Marie in the Alpes de Haute area of Provence, France. A bakers stall is probably one of the most popular displays at any market because of the wonderful aroma of fresh breads. The market, in the village of Moustiers Ste Marie in the Alpes de Haute, Provence in France, is no different. The village perches on the side of a cliff near the entrance of the Verdon Gorge and is a popular tourist stop.Bakers Market Stall in the village of Moustiers Ste Marie, Alpes de Haute, Provence, France, Europe. Photo of a bakers stall in the village of Moustiers Ste Marie in the Alpes de Haute in Provence, France in Europe.